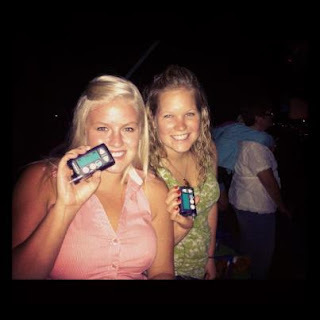 Kayla's Life Notes: Diabetics Gone Country! It's not everyday that you get to spend some time with a diabetic - that strange feeling that all of a sudden you're not the only one concerned about carbs or about your pump tubing getting caught. It's a breath of fresh air to see someone just like you, a small reminder that you're not alone. This weekend I went to Buffalo, NY. With my friend Shannon and Heather. Heather is a type 1 diabetic and we met a couple years ago at a Connected in Motion event and ever since then we have been good friends keeping touch through texting or Facebook. We have also done a couple other events together. The funny thing is that Heather and I both have purple pumps and not only that, but often people tell us we look alike. Before I had even travelled too far, I realized I forgot my insulin pump at my apartment. A good start to the trip - but it made for a good joke about Heather and I possibly having to share an insulin pump. I had packed a couple supplies, but I was feeling a little less anxious because I knew that if I forgot something chances are Heather might have it - besides the insulin pump, I'm pretty sure she needs that and cannot share! It was nice when we sat at the table and both pulled out our meters, I knew both of us were calculating carbs in our heads and then reaching for our pumps to dial insulin. It's that mutual understanding that makes it great to have someone just like you around. Later at the concert I made a joke that instead of holding up lighters or our cell phone for the slow songs, we could turn the light on our pumps and wave them in the air.